MATT VEASEY: What is the Best-Case Scenario for Phils 2015 Outfield? What is the Best-Case Scenario for Phils 2015 Outfield? 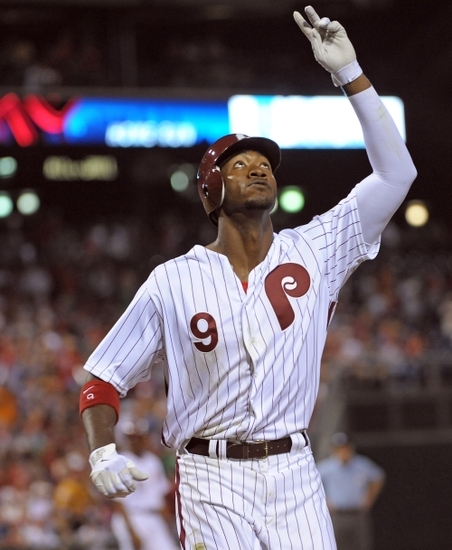 Ruf, Revere, Brown: upside on projected Phils 2015 outfield? What if the Phillies outfield actually came through in 2015? What if that projected outfield of Darin Ruf, Ben Revere, and Domonic Brown all reached their full potential at once? What is the best-case scenario for the Phillies outfield? The professional oddsmakers in Las Vegas have made the Phillies the longest of longshots to actually win the 2015 World Series. At 250-1, the Phils are tied with the Minnesota Twins for that dubious honor. Is there any chance at all of them beating those odds? And if not, is there any chance of the team at least outperforming the low expectations? Let’s forget the longest of long shots, a World Series win, and concentrate on simply reaching .500 again, maybe even having an unexpected winning season. One of the keys to making that happen would certainly be increased offensive production from the outfielders. A lot can happen between now and the start of the 2015 season, including the club deciding to use Cody Asche in left field, moving Ruf in to 1st base, and playing Maikel Franco at 3rd base. But for now at least, the plan is for Asche to stay at 3rd base. 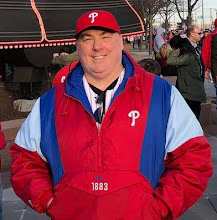 If Franco makes the club out of spring training it is likely to be at 1st base, either in place of Ryan Howard or in a right-left platoon at the beginning. In that most likely scenario, it would be Darin Ruf in leftfield, Ben Revere in centerfield, and Domonic Brown in rightfield. The expectations for such an outfield are one thing, completely based on their performances to this point in their careers. But all have been considered to have greater potential. What if they all reach that potential together at one time this season? Darin Ruf is 28 years old now, and will play the bulk of the 2015 season at that age. He spent years progressing methodically through the Phillies minor league system after being selected in the 20th Round of the 2009 MLB Draft. At Reading in 2012, Ruf had his best season, clubbing 38 homers, driving in 104 runs, and hitting for a .317 average. Ruf has spent parts of the last 3 seasons with the Phils. Derailed by an assortment of injuries, Ruf has managed just 442 MLB plate appearances in that time, close to one full season worth. He has 20 homers, 48 rbi, and has hit .251 in the big leagues. Darin Ruf certainly has power, and if he could just stay healthy and remain in the lineup for a 500+ plate appearance season, a year of 25+ homers and 80+ rbi is certainly plausible. The entire key for Ruf is remaining healthy. Ben Revere is 26 years old, and will turn 27 at the beginning of May. He was the Minnesota Twins 1st Round pick in the 2007 MLB Draft out of high school, and then spent a half-dozen years progressing steadily through their minor league system. The Phils obtained him in a December 2012 trade for pitchers Vance Worley and Trevor May. Revere got a cup of big league coffee with the Twins in 2010. He then became their starting centerfielder in both 2011 and 2012 before the trade, and the Phillies centerfielder following in 2013 and 2014. In just over 4 seasons, Revere has more than 2,000 MLB plate appearances, hitting for a .291 average and stealing 145 bases. A full season out of Ben Revere in his prime, reaching his full potential, would look something like a .300 batting average with 50 steals and 80-90 runs scored. If he had consistently productive rbi bats behind him, he could go over the 100-runs mark. Domonic Brown is 27 years old, and will play almost the entirety of 2015 at that age, so it should be considered that he is just now entering his prime. The Phils 20th Round pick in the 2006 MLB Draft out of high school, Brown has received more than 2,000 minor league plate appearances in advancing methodically through the system. From 2010-14, Brown spent at least parts of the season in Philadelphia, including the bulk of the last 3 seasons. He appeared to have a breakout in 2013 when he was named to the NL All-Star team. He hit 27 homers, knocked in 82 runs, and hit for a .272 average. But in 2014, Brown seriously regressed. In virtually the same number of plate appearances, he hit just 10 homers, drove in just 63 runs, and hit for just a .235 average. In the field he often looked lost, with numerous misplays. He quite simply looked like he did not belong in the big leagues. Brown was hyped by many national sources as a top prospect for a handful of years prior to his big 2013 campaign. So which is he, the breakout 2013 player, or the bust 2014 player? Suppose it’s more the former, and in his prime Brown puts it all together to the tune of 25-30 homers and 90-100 rbi with a .270+ batting average? How would it affect an overall Phillies 2015 finish if Ruf hit .285 with 25 homers and 80 rbi, Revere hit .300 with 50 steals and 100 runs, and Brown hit .275 with 30 homers and 100 rbi? Of course, there is probably a better chance that we won’t see anything close to those marks, at least from the corner outfielders. But with little more to dream on with the 2015 Phillies than the next trade of Glory Era veterans for prospects, feel free to dream.